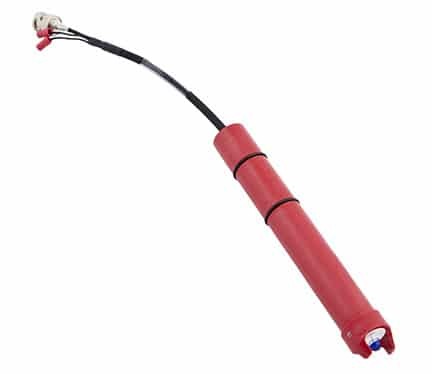 The ST857 is a rugged, sealed, replacement sensor designed for insertion / retraction applications. The Patented solid state reference cell features the unique IonTrap™ design for extended service life in the most severe applications. 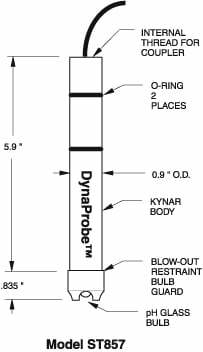 The body, with an integral bulb guard and anti-blowout restraint, is moulded from chemically resistant Kynar(PVDF) and the reference junction is porous Teflon. Built-in temperature compensators are available. Sensor also available in ORP (Redox) version. Also fits TBI / Bailey Model TB557 “Hot Tap” sensor assemblies.